You’ve got to appreciate Pixar for everything they do. Out of every animated movie studio around, I’ve only ever seen Pixar work the hardest at creating something so deep and relevant to its target audience as well as creating something that’s equally as entertaining to anyone else watching. It does this in a particularly interesting and bold way, by mixing emotions and themes that are naturally polar opposites. 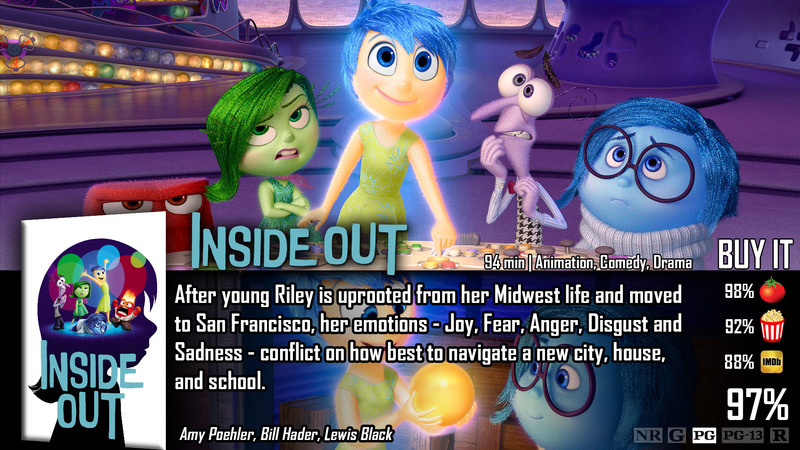 Inside Out paints a portrait between light-hearted humor and sickening depression, and I love the outcome. Meet Riley, an average American girl with an average American family that loves her. When she moves to San Francisco, Riley hits an all-time low, coming face-first with the effects of depression. Controlling her every action in her brain are the very colorful characters of Joy, Sadness, Fear, Disgust, and Anger. When Sadness and Joy go missing, Riley was only ran by Fear, Anger, and Disgust, fulfilling that depression further. This movie is just one gigantic metaphor about adolescent depression…or maybe just depression in general. They weren’t trying to hide that or anything, but the way it was made was ingenious. I truly believe that this is without the doubt the smartest movie Pixar has ever done. Period. Why? Because no longer do kids have to feel they are alone or confused about why they feel so bad. There is an infinite amount of things going on in your head that are hard to completely explain or understand, and this movie does it through a perfect metaphor. No there aren’t actual characters going around in your head, but what they represent does. What they represent and how they work with each other continually impressed me throughout the film. Sadness affects everything like a cancer and drags on about things that don’t really matter, even when you try to focus on the good, joyous things. You could ruin the “islands of your personality” depending on the actions that you take and how you feel about them in general. Rash decisions can make or crumble your world, and your happiness could be lost because of it. This is all shown through funny characters making jokes throughout the thing, but it’s not hard to find the core messages in the movie, and it is impossible not to love it when you see them . Past the intelligent writing and metaphors, what else did this film have? Visuals. Pixar has always been known for their impressive arrangement of visuals that people can’t forget, and this movie is no exception. Everything about this movie is memorable in multiple ways, making it an impeccable and nearly perfect experience at the cinema. Now, as far as negatives go, I clearly gave it a near perfect score – so why not the whole 100% Partially because I’m not personally in the target audience range and partially because people kept saying how it made them cry – and I can’t understand why. This tells me that maybe I missed out on something important. It’s not a big deal, but I don’t like not knowing. Everything, but if I had to pick one thing, it would be that Inside Out is the smartest movie I’ve ever seen Pixar do – that it’s ability to explain something difficult to children in a fun way…it’s incredible. The fact that you haven’t seen it! Nice review! I really enjoyed this movie, it was really inspirational. It was a little high brow for a kids film but it will definitely have a strong legacy.